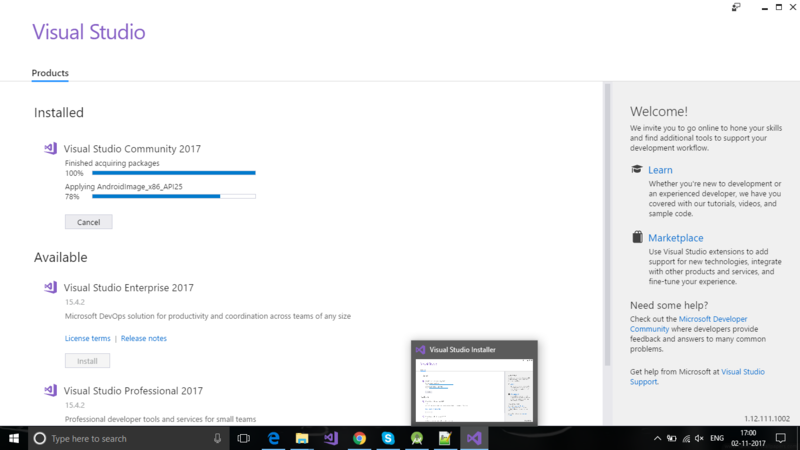 Visual studio Installation stuck at a point. I am new with xamarin. Almost 3 hours are spent for downloading. But not moving the downloading status. What is Applying android image_x86_API25? Why this happening? I don't know. Anybody please help me. Try different mechanisms for downloading, but always hangs at Applying android image_x86_API25, maybe it is the issue with Visual Studio 2017 new version. Finally solved by installing VS on another pc, 6 days of a headache over.